Barack Obama was elected president in 2008 in large part because of the overwhelming support he received from young people. And in early 2012 matchups, Obama holds substantial leads among Millennials over both Mitt Romney and Rick Perry. However, since early in his presidency, Obama’s job approval rating has fallen substantially across all age cohorts, Millennials included. Only about half of Millennials (49%) approve of the way Obama is handling his job as president, down 24 points from February 2009. Obama’s job approval is little different among Gen Xers (44% approve), and somewhat lower among Boomers and Silents (40% each). Throughout much of his presidency, Obama’s job rating has been higher among Millennials than among older age cohorts. In February 2009, shortly after he took office, 73% of Millennials, 63% of Boomers, and 62% each of Gen Xers and the Silent Generation approved of the way Obama was handling his job as president. Age and race are factors in the positive opinion of Obama among Millennials. Non-whites generally are much more approving of Obama’s job performance than are whites and Millennials are by far the most racially and ethnically diverse age cohort. In addition, white Millennials have less negative views of Obama than do older whites. Currently, 39% of white Millennials approve of Obama’s job performance while 47% disapprove. Among whites in older age cohorts, comparable percentages approve of Obama’s job performance but more disapprove. Roughly six-in-ten white Gen Xers (60%), Boomers (61%) and Silents (62%) disapprove of the way Obama is handling his job as president. White Millennials also are less likely to strongly disapprove of Obama’s job performance: 30% of white Millennials very strongly disapprove, compared with 43% of white Gen Xers, 48% of white Boomers and 52% of white Silents. Nonetheless, among Millennials and the older cohorts, more whites strongly disapprove than strongly approve of the way Obama is handling his job. 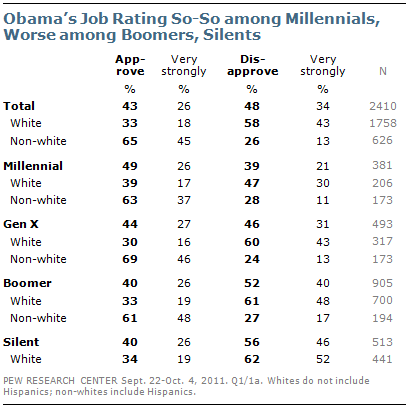 There is little difference in views of Obama among non-white Millennials, Gen Xers and Boomers. About six-in-ten or more in all three cohorts approve of his job performance. And substantially more in each age cohort strongly approve than disapprove of the way Obama is handling his job. Among the predominantly white Silents, there are too few non-whites to analyze. How Does Obama Make You Feel? There are sharp generational differences in negative personal reactions toward Obama, particularly when it comes to feelings of anger and unease. Overall, when asked if Obama makes them feel angry, 29% say yes while 70% say no. Four-in-ten (40%) say Obama makes them feel uneasy, while 53% say they have been disappointed by Obama. Silents are more likely than those in younger age cohorts to say that Obama makes them feel angry: 40% of Silents say Obama makes them feel this way, compared with 32% of Boomers, 28% of Gen Xers and just 19% of Millennials. In a callback survey of voters shortly after the 2008 presidential election, just 11% of Silents, and comparable percentages of voters in other age cohorts, said Obama made them feel angry. Even in the afterglow of Obama’s victory, Silents and Boomers were more likely than Gen Xers or Millennials to express unease with Obama, and these differences have persisted. In the current survey, Silents are the only age cohort in which a majority (52%) says Obama makes them feel uneasy; 43% of Boomers, 36% of Gen Xers and 33% of Millennials say Obama makes them feel uneasy. Notably, the differences between Silents and Millennials in feelings of anger and unease toward Obama are as wide among whites as the overall public. Nearly half of white Silents (46%) say Obama makes them feel angry; 58% say he makes them feel uneasy. Among white Millennials, 22% say he makes them feel angry, while 39% say he makes them feel uneasy. Overall, there are more modest generational differences in views of whether people feel disappointed by Obama: 59% of Silents express this view, as do 56% of Boomers, 53% of Gen Xers and 47% of Millennials. In the days after the 2008 election, large majorities of those who reported voting in the election said that Obama made them feel hopeful (69%) and proud (65%). Today, just 43% of the public says Obama makes them feel hopeful and 45% say he makes them feel proud. 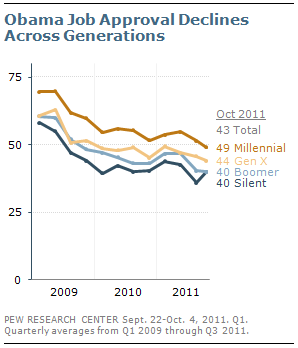 There have been substantial declines in positive reactions toward Obama across all age cohorts. Yet the change among young people has been particularly striking. Shortly after the 2008 election, 81% of Millennials said Obama made them feel hopeful, while 80% felt proud. 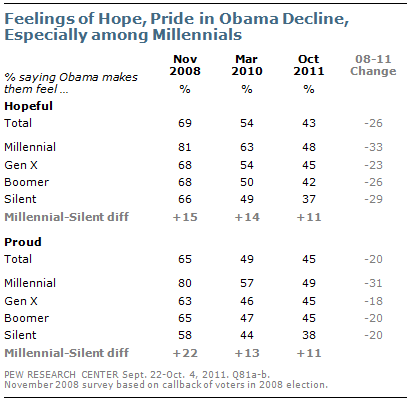 Today, only about half of Millennials say Obama makes them feel hopeful (48%) or proud (49%). Nearly twice as many Americans say Obama’s economic policies have made economic conditions worse than say his policies have made things better (38% vs. 20%). Close to four-in-ten (37%) say that, nearly three years into his presidency, Obama’s policies have not had an effect so far. The balance of opinion regarding the impact of Obama’s economic policies has grown much more negative since 2009. And it has turned more negative just since the beginning of this year: In January, about as many said Obama’s policies had made things better (28%) as said his policies had made conditions worse (31%). Boomers and Gen Xers have become critical of the impact of Obama’s economic policies. In January, about the same percentages in both cohorts said Obama’s policies had made conditions better as worse. Currently, more than twice as many Boomers say Obama’s policies have made conditions worse than better (44% vs. 19%). 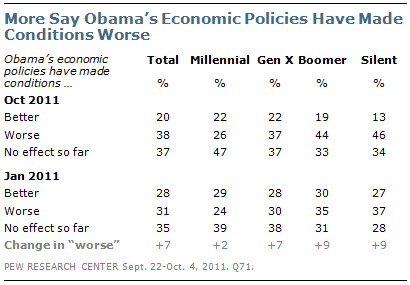 Among Gen Xers, 37% say Obama’s policies have made conditions worse, while 22% say his policies have made things better. The balance of opinion among Silents, already tilting negative at the start of the year, has grown more so. Millennials, however, continue to express mixed views of the impact of Obama’s economic policies: 26% say his policies have made conditions worse, the lowest percentage of any age cohort, while 22% say they have made conditions better. About a year ago, as the GOP headed toward major victories in the 2010 midterm elections, Xers and older age cohorts expressed mixed views of the Republican Party. In September 2010, for example, 48% of Silents said they had a favorable opinion of the Republican Party, while 44% had an unfavorable view. Today, however, views of the GOP have turned negative among all cohorts – just 38% of Silents have a favorable opinion of the Republican Party, while 55% view it unfavorably. Silents’ opinions of the Democratic Party are equally negative: 39% have a favorable opinion of the Democratic Party and 56% have an unfavorable opinion. 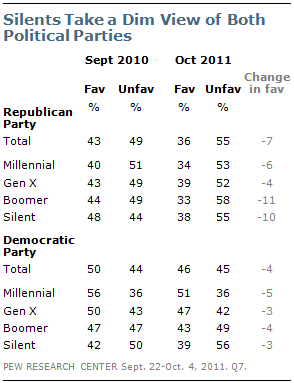 Boomers also have a more unfavorable opinion of the Republican Party than they did about a year ago. In September 2010, 44% viewed the GOP favorably and 49% had an unfavorable impression. Currently, just a third of Boomers (33%) have a favorable opinion of the GOP, while 58% have an unfavorable view. In the current survey, Boomers’ favorable rating for the Democratic Party is 10 points higher than the GOP’s (43% vs. 33%). Currently, more Gen Xers (47%) have a favorable opinion of the Democratic Party than the Republican Party (39%). And Democrats continue to hold a wide favorability advantage among Millennials (51% favorable toward Democratic Party vs. 34% for GOP). 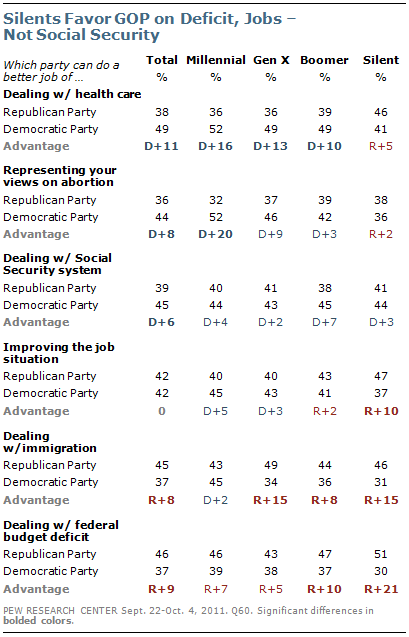 While most Silents view the GOP unfavorably, they prefer the Republicans on several key issues. By 51% to 30%, more Silents say Republicans can better handle the budget deficit than Democrats; Silents also favor the GOP on immigration (by 15 points) and improving the job situation (10 points). But Silents are divided over which party can better handle health care, abortion and Social Security. More than four-in-ten (44%) say the Democratic Party can do a better job in dealing with the Social Security system while about the same percentage (41%) favors the Republicans. Millennials have a much more favorable opinion of the Democratic Party than the Republican Party, but they clearly prefer the Democrats on only two issues – representing their views on abortion (by 52% to 32%) and dealing with health care (52% to 36%). Millennials are split over which party can better deal with the Social Security system, improve the job situation, deal with immigration and deal with the federal budget deficit. Gen Xers say the Democratic Party can do better on dealing with health care (by 49% to 36%). But more say the GOP than the Democrats can do better on dealing with immigration (49% to 34%). Boomers are conflicted in evaluating which party can better handle major issues. By 49% to 39%, more Boomers say the Democratic Party can do better on health care. Boomers also prefer the Democrats on Social Security (45% to 38%). Notably, older Boomers – those ages 56 to 65 – favor the Democrats on Social Security by 13 points (48% to 35%), while younger Boomers (ages 47 to 55) are divided over which party can better handle this issue. By contrast, Boomers are more likely to say that Republicans can do a better job than Democrats dealing with the federal deficit (47% vs. 37%) and dealing with immigration (44% vs. 36%). By wide margins, Millennials, Gen Xers and Boomers say the Democratic Party is “more concerned with the needs of people like me.” Silents are divided; 45% say Democrats are more concerned with the needs of people like them and 42% say the Republicans. By 50% to 31%, Millennials see the Democrats as better able to bring about the kind of changes the country needs. By contrast, slightly more Silents say the GOP can bring about needed changes (44% to 35%). Gen Xers and Boomers are split over which party can better bring needed change. 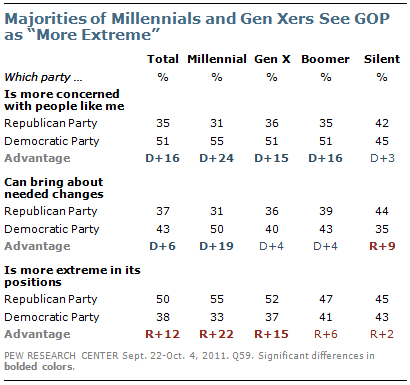 Roughly half of Millennials (55%) and Gen Xers (52%) view the Republican Party as “more extreme in its positions,” and 47% of Boomers agree. About as many Silents see the Democrats (43%) as the Republicans (45%) as having more extreme positions. In 2010, Boomers and Silents, on balance, were more likely to say they agreed than disagreed with the Tea Party movement. But that is no longer the case. Combining all surveys conducted last year, 34% of Silents said they agreed with the Tea Party, while 22% disagreed. 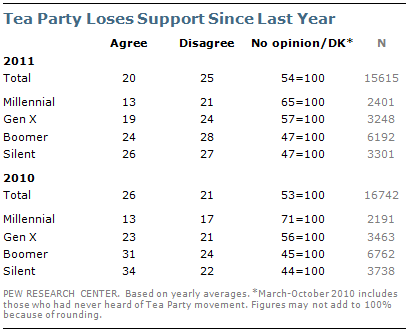 More than four-in-ten (44%) offered no opinion of the Tea Party movement. In surveys conducted through October of this year, opinion is evenly divided: 26% agree and 27% disagree with the Tea Partiers. Nearly half (47%) still offer no opinion. Among Boomers, the balance among those who offer an opinion has shifted from positive to negative. In 2010, 31% of Boomers said they agreed with the new movement, while 24% said they disagreed; 45% offered no opinion. This year, 24% agree, 28% disagree and 47% offer no opinion. Opinion among Gen Xers also has turned more negative. In 2010, 23% said they agreed with the Tea Party, while 21% disagreed. In 2011, 19% say they agree with the movement, while 24% disagree. In both years, almost six-in-ten offered no opinion. More Millennials offer an opinion of the Tea Party movement in 2011 than did so in 2010, but the balance of opinion is largely unchanged. In 2011, 21% say they disagree and 13% agree; nearly two-thirds (65%) offer no opinion. In 2010, 17% disagreed, 13% agreed and 71% offered no opinion.